After a day of constant drizzle that turned the grounds into a mud bog, today a warm sun is peeking between fluffy clouds over Belgium Comes to Cooperstown at Brewery Ommegang. It’s an annual festival famed in these parts—and mostly unknown out west. Campers arrive on Friday and pitch tents on the lawn, in the shadow of the brewery, or in the fringes of the forest, and spend the weekend doing something that resembles a music festival, a beer fest, and tailgate party all in one. It’s an interesting contrast with the Oregon Brewers Fest, which happened last weekend and which is focused entirely on beer. 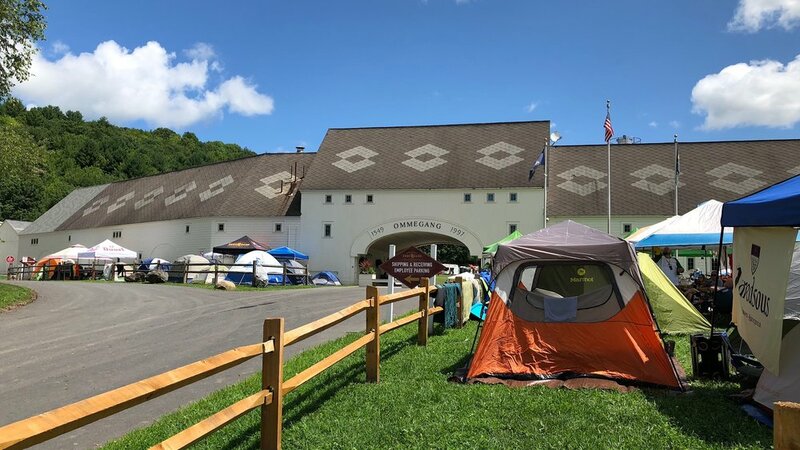 The beer fest portion of the event doesn’t even start until today; yesterday campers pitched tents and started their own private parties while taking the opportunity, when the rain slackened, to wander around and socialize. As I walked in, I had to dodge campers hauling in an armada of coolers with their gear. At the center of all of this is the brewery itself, which is one of the prettiest I’ve seen on this continent—or any other. When Don Feinberg and Wendy Littlefield joined with Duvel Moortgat to build this place 21 years ago, they really went all out. I can’t help but think they chose the rolling hills outside Cooperstown because they so closely evoke Belgium. Driving in on increasingly smaller roads was reminiscent of my experience navigating the fields and countryside of West Flanders.